Tarot spreads are the patterns in which the cards in a tarot deck are laid out for the reading. Each layout has an energy of its own, and each card within the spread represents an aspect of the reading as a whole. Overall, there are hundreds of possible tarot spreads, and new ones are created on a regular basis. 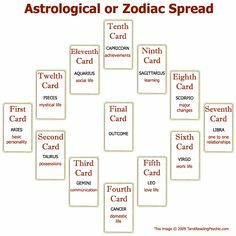 As such, we cannot cover all possible tarot spreads, so we will take a look at the most common options. The tarot cards are just as important as the spread chosen for the reading. Choosing the right tarot spread is the starting point on the discovery path. Ideal for beginners, the three card spread is the simplest layout and is a great choice for beginning readers. Spread three cards horizontally and count from left to right. The first card represents the past. The middle card represents the present, and the third card represents the future. The first card helps disclose any issues that are affecting the situation. The second card helps you identify what is going on at the moment. The third card reveals possible outcomes that may occur based on what querent does. This format is typically used to address simpler questions. The next card spread uses five cards and offers a bit more information about the problem while also suggesting the outcome if the querent chooses to take a course of action. In this spread, the cards form a cross. 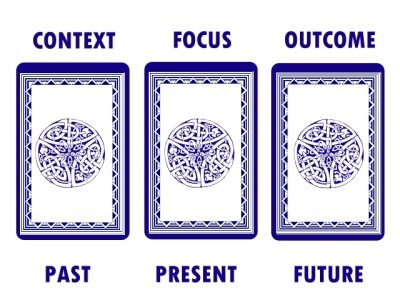 The card to the right of the center represents future outcomes. The center card represents the present situation.The card to the left of the center reveals the past that is still affecting the current situation. The card on the bottom represents the reasons that lead to the situation or the cause for the current situation. 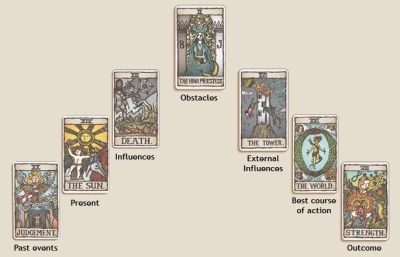 The card on the top depicts possible outcomes that may occur when the querent follows a course of action. This spread is most useful to help the querent determine what to do about a situation. 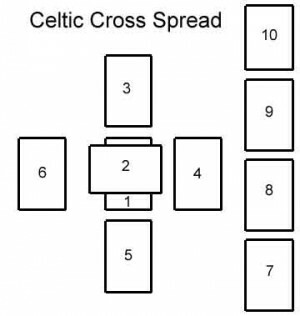 The Celtic cross spread is the most well-known tarot spread. It uses 10 cards and a circle and line layout. This spread has been adapted and personalized by many readers and therefore has many variations. A popular spread places a five card spread – with card one in the center, card two on the top, turned to the side to form a +, 3 above 1, 4 below 1, 5 on the right, and 6 on the left. Cards 7 through 10 are laid to the side in a line, with card 7 on the bottom, and card 10 on the top. Each card is turned to a slight angle. Card one represents your present condition. Card two represents your current obstacles or troubles. Card three represents the best possible outcome. Card four represents the cause of your current situation. Card five represents your immediate past, and card six represents your immediate future. Card seven represents who you are right now in general, and how you relate to the theme of the question. Card eight represents your current surroundings in terms of family, friends, and environment that relates to your question. Card nine represents your hopes and fears in regard to the question, or in general in your life at this time if you did not have a specific question. Card 10 represents the outcome in regard to the question or otherwise how this phase of your life turns out. The horseshoe tarot spread is a seven card layout. Three cards are placed on either side of a center card, staggered to look like a horseshoe, and moves from left to right. The first card represents the past. The second card represents the present. The third card represents hidden influences. The fourth card represents the querent. The fifth card represents the attitudes of others around the querent. The sixth card represents what the querent should do, and the seventh card represents the outcome. The astrological tarot spread uses 12 cards placing one card in each position around the circle like a clock.This layout is designed to provide an overview of the next 12 months. The first month is the current month, or if you are close to the end of the month, month one can be the following month. An optional 13th card can be placed in the center of the circle to represent the tone for the whole year. Because there are 78 cards in a tarot deck, you can create the circle six complete times, with six center cards. The more times you go around the circle, the more information you will obtain. Burdens – restrictions, dangers, subconscious, secret fears. 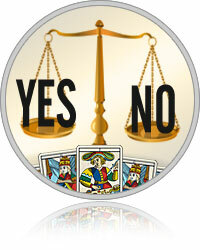 Though most tarot readers do not like yes or no questions simply because they are limited to two answers, a special eight card yes or no tarot reading allows you to remove doubt and take action using clear-cut advice from the cards. It is a non-traditional spread, and therefore may not be offered by all readers. As a reader, you can learn multiple layouts and customize them. As a querent, you can request a specific layout, or ask your reader for guidance based on what it is you are hoping to glean from the reading. Readers often have their own specialized versions of a layout, so be sure to ask about the layout if it’s something you’ve never seen before.